Esther’s eyes are sparkling. And so are her shoes. As she runs down the corridors of CoRSU hospital in Uganda, tiny lights blink from her new light up shoes- with every glorious step. Esther likes the little lights. It was only a few months ago that everything was very different for the six-year-old girl. Esther was born with a clubfoot. Her right foot was turned inside in such an angle that she could hardly step on it. Walking was almost impossible… moving about caused a lot of pain. Long distances were agony for Esther. She had to crawl across steps and slopes so that her clubfoot wouldn’t throw off her balance. The pain of walking for more than 10 minutes prevented Esther from attending school. When other children played football, Esther could only watch them from the sidelines. 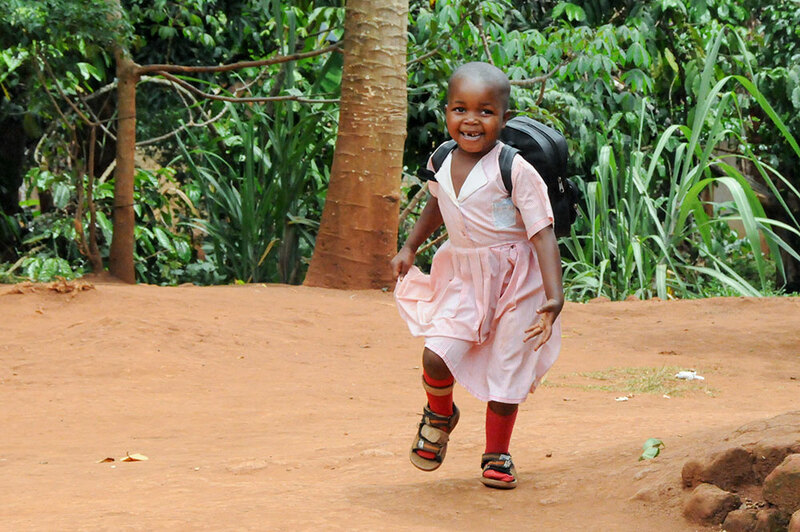 Esther’s dream was to go to school with the other children, to play with them without them calling her names. And to be able to wear sandals and shoes. Esther’s father left the family because he didn’t want to care for a “crippled” child. So Esther’s mom, Prose, is on her own struggling to keep her two daughters fed and surrounded by love. Agnes, one of Hope and Healing International’s community workers, heard from a local teacher about the little girl with a clubfoot who wasn’t attending school. So, Agnes went to visit Esther and her mom, to see how she could help them. Esther was very shy. She hardly said a word to Agnes. Agnes could tell that Esther was trying to hide her clubfoot under her skirt. Then Agnes told them the most incredible, unimaginable news. Supporters in Canada would pay for Esther to receive the treatment and surgery Esther needed to be able to walk straight and pain-free. Esther and Prose could hardly believe their ears. Agnes arranged for Esther and Prose to come to CoRSU hospital where Esther received a series of physiotherapy treatments, surgery, casts, braces, and shoes. Lovely shoes. Shoes that Esther had dreamed about. But, it wasn’t easy. It was a long process from start to finish. Prose was taught how to stretch and massage Esther’s foot in between treatments. These sessions caused Esther to cry out in pain. Prose found it very difficult to put her sweet little daughter through this daily pain, but the CoRSU staff encouraged Prose to continue. The surgery was important, but the treatments were just as vital for full recovery. If you saw Esther today, you would see a confident, happy and playful child. Eager to learn… eager to play. In her sparkly new shoes, Esther cuts a corner, jumps across a little mound of sand and climbs up a heap of debris and wood. Having reached the top, she seems to be suddenly surprised and perhaps a little overwhelmed by herself and her ability. Slowly, she retreats back down and runs to Agnes for a comforting hug. Esther’s cousin, Charles, hugs her freely now–something he would never have done when Esther had a clubfoot. The other kids ask her to play with them… spinning a bicycle tire. No one calls her names anymore. Esther runs with them, pushes the tire and laughs. “Earlier she was always excluded, but now she is one of them,” Prose happily said. She can finally attend school with the other kids. In no time she is all caught up. Esther, who usually doesn’t talk a lot, told Agnes that she likes going to school. After school lessons, Esther’s mother does their hospital “homework” with her—stretching, strengthening her muscles. “Esther has changed so much”, Prose said “I would never have believed that she would be able to walk one day.